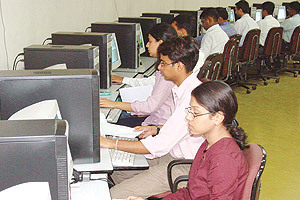 IIFT has three state-of-the-art Computer Centres with a Local Area Network comprising IBM Blade Centre, ,HP Servers and 300 Pentium IV nodes with wired & wireless access to the network available in the campus. The software applications include Novell Netware, Windows 2003 Server, Windows XP, SPSS, Oracle, Visual Basic and Java. Other facilities include 24-hour Internet access via a 8 MBPS leased line, access to national and international databases, in-house publishing facilities, LCD / Plasma Screen Projection Systems, etc.